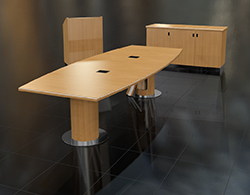 The Articulating Conference Table by Wilcox is the single most functional and versitile conference table for both general conferencing and AV conferencing use. We offer four models of the ACT in a size that will complete your room. Explore the ACT. 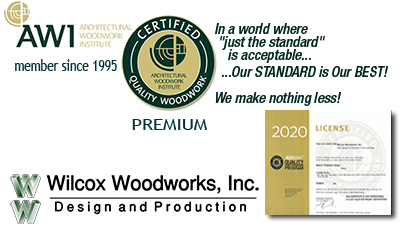 Wilcox Woodworks, Inc. is a full service architectural millwork provider. Design, production and installation of panel systems and trim for lobbies, elevators, and tenant build-outs. Craftsmen from Wilcox Woodworks installed doors, cabinets, interior and exterior trim, and siding. 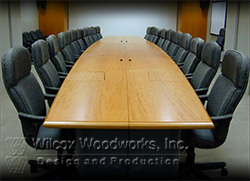 Wilcox Woodworks offers functional yet traditional furniture pieces for the AV conference room. Custom Tables in all the standard shapes and configurations are built from any market available wood species, from our or your design. We have introduced our STANDARD Line, a collection of Conference Room and AV Conferencing Furniture. Our program is designed to provide purchasers with a quick and easy experience to purchase custom furniture. Go to The STANDARD Line for more information, specifications, pricing, and easy ordering. Pergolas, Arbors, Gazebos, Gates, and Benches. 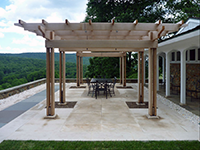 Let Wilcox Woodworks help you complete your hardscapes project with custom built and installed accessories from Spanish Cedar, Western Redwoods, or other resilient outdoor use woods. Cashwraps, counters, display case, fixtures, tables, complete interior packages.